"It would be useful to me if Legacy automatically displayed the date individuals were last edited on the Family View screen. Is this possible?" Wayne, this is already available on the Family View. In the very far lower right of the Family View is a date. This is the date that the currently-highlighted individual was last modified. Alternatively, you can display the last modified date for both the husband and the wife. See the image below. For step-by-step instructions on selecting which fields to display, click here. Massachusetts researchers are in luck! The Massachusetts Archives has recently published a searchable index to deaths that occurred in Massachusetts between 1841-1910. Each index entry will include the person's first and last name, the town or city where the event occurred, the year, volume number, and page number. The database is searchable by first and last names, year, and location. I have several 2" binders labeled Birth, Death, Marriage, Census, Obit, Photo, Probate, Will, etc. Add all pertinent source info, repository etc. Cite the source to my database to all appropriate areas. File my document in the appreciate binder. Legacy automatically keeps track of my source document file #'s and makes it easy for me to just increase the # to the next in sequence, but this is actually very easy to keep track of even without this included feature of Legacy. As an example, for the first birth certificate the file # would be 'Birth 1" the next would be 'Birth 2" and so on, and they would both go in the 'Birth' binder in sequence, same routine for Death, Marriage etc. Each getting the next higher available filing # and put into the appropriate binder. This system provides a quick and easy way to file all documents and no need to make duplicate copies when more than one family is represented in the document (marriage, census etc.) as is necessary in surname or family group files. It doesn't matter if you have a marriage certificate from 1866 or 1966, they are just filed in sequence of when you received them. This eliminates LOTS of headaches! As a side note: I do make copies of the document (either I print from the scan or from my copy machine) and keep in a BIG binder on my desk, which has dividers for all of the different file types. This binder is what I use to make copies of the documents for other researchers (or send the scans by e-mail) and for quick and easy reference while I'm working, and allows me to keep the original documents in the fire-proof safe (where they are hopefully well-protected). When I need to prepare a report (for family or fellow researcher) all I have to do is open my genealogy (Legacy) program, see what files are sourced to that individual and write down the file #'s (or easily print out a source report if many individuals will be in the report), pull the document copies from my 'desk binder' and viola' there are ALL of my source documents ready to include in a report and mail away.... (If by e-mail I just include the document scans, filed on my computer the same way as listed above). * Legacy will also include source pictures within the report, but I find many people prefer them to be separate from the reports which makes them easier for them to save to their files. You might have noticed, above I listed a binder called 'Photos'.... I use it in very much the same way, but add one more little step.... I open the scanned photo in my photo program (I use Adobe Photo Elements) and simply add information (via 'File Info') of those shown in the photo, date photo was taken (or best estimate), who or where the photo came from (my album, fellow researcher, publication etc). This enables the photo to contain all info within the file, yet does not require you to change the photo itself (as in adding text directly to the photo). The info can be printed with the photo as a 'Caption' via 'Printer Options' with most printers if desired. In addition, when adding the photo to Legacy this data is automatically added to the note field :-)... a real timesaver! (Note: Info is NOT added if linking through the Picture Center in Legacy; only if photo is directly linked to person, source etc. Maybe someday Legacy will add this function in Picture Center, but can't say for sure). One other 'Biggie' I wanted to mention is to ALWAYS use archival quality sleeves (available at your office supply store in boxes of 100 and more, and really cheap on sale :-) for all of your original source documents... even the copy machine copies sent to you by fellow researchers, after all they are 'your' originals and are in need of safekeeping! Thanks Connie for sharing your system. Please direct any questions to her. We have also published other systems here. Some good advice - once you have a system that works well for you, stick with it. There's probably not a perfect system for everyone. First, let me say I LOVE your software. Very helpful!! Question though: when in the Research Guidance tab, how can I get back to the data input screen for my ancestor without closing the Research Guidance tab? 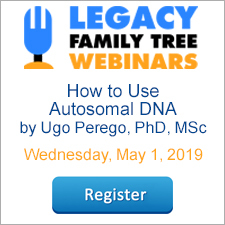 Every time I find something new about my ancestor and want to type it back into Legacy, I have to shut down Research Guidance and I lose my place. We're happy to hear Research Guidance is helping you find new information about your ancestors! Whenver you find new information, just click on the Edit button in the upper right-hand corner of the Research Guidance screen. This will open the Individual's Information screen where you can then type in the new information. Research Guidance was developed by a team of professional genealogists. Therefore, the sources suggested on the Suggested Sources tab are the same sources professionals would use. These sources have been ranked in order of priority, so the ones at the top of the list are the ones that even professionals would turn to first. Order Form - Added new video training series product and rearranged some other products. Click here for a list of fixes. This selection was re-published here with the permission of the author. Columbia, Maryland -- 20 August 2006 -- Archive CD Books USA is proud to announce a major new collection of digitized books for researchers of early New England families. For the first time, the Compendium of New England Pioneers makes all of the classic genealogical dictionaries of New England available on a single CD. The collection encompasses 14 books (22 volumes), nearly 8300 pages, and thousands of families of early New England settlers through several generations. The titles in this collection were assembled in consultation with Robert Charles Anderson, FASG, an authority on New England research, and are so recognizable to experienced researchers that they are often simply referred to by the last name of the author. They include classic works by Eliot, Farmer, Hinman, Goodwin, Drake, Savage, Austin, Pope (2), Holmes, Flagg, Noyes, Bolton, and Spencer. Anderson said, “The broad genealogical surveys collected here comprise the best colony-wide resources for the study of 17th-century New England families. As such, they constitute the resource of first resort for building the framework of Great Migration sketches.” Anderson is the Director of the Great Migration Study Project for the New England Historic Genealogical Society, editor of the Great Migration Newsletter, co-editor of The American Genealogist, and Genealogical Consultant for Archive CD Books USA. “Our CDs combine high-quality images of every page that was originally published with the ability to do powerful full-text searching, including AND, OR, phrase, and proximity searches,” said Bob Velke, President of Archive CD Books USA. “For the first time, we’ve also included special indexing technology that will allow researchers to conduct very fast searches across all of these books at the same time,” said Velke. “Many of the individual titles have been very popular on our web store,” said Velke, “and we haven’t forgotten those loyal customers.” The Compendium is priced at just $89.95 which is 66% off the combined regular prices of those individual books. Those who have bought one or more of the individual titles have been extended full credit for those purchases when upgrading to the Compendium. Advance orders will be shipping soon but the Compendium of New England Pioneers will make its public debut at the Federation of Genealogy Societies and New England Historic Genealogical Society conference in Boston, Mass., August 30 - September 2, 2006. For details about the Compendium of New England Pioneers, please visit http://www.ArchiveCDBooksUSA.com/nepioneers.htm. About the company: Archive CD Books USA was founded in 2005 in order to make digital reproductions of old books available to family historians, to donate original publications to libraries and other institutions, and to cooperate with these repositories to preserve their existing collections for future generations. It is a member of the international Archive CD Books Project whose other affiliated companies digitize books from Great Britain, Ireland, Canada, and Australia. Those with Texas research will be happy to hear about Ancestry's expansion of their Texas death index. Previously the index covered the years between 1964 and 1998. This has recently been expanded to cover the years between 1903 and 2000. Subscribers can access the death index by clicking here. I sure wish there was a way to create one of the charts (ie pedigree, etc) and highlight and copy it to place in an email. Sometimes I want to send genealogy info without having to manually write it all. Any suggestions would be wonderful. Preview the desired report to make sure it looks good. Enter a filename and remember where you save the file. The report has now been saved as an electronic document on your computer. The final step is to attach this file to your email. The recipient of the report only needs to have Adobe Reader installed on their computer to view the report. Most likely, they already have it installed, but if not, it can be downloaded free at http://www.adobe.com. In the new Creating and Sharing Perfect Reports video there is an entire section of the video devoted to sharing reports with others via email. If you already have the video, watch the section entitled Successful Correspondence. This section shows you step-by-step how to copy/paste a report into an email, or how to attach a .pdf to send. 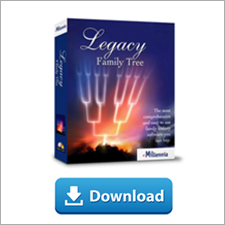 Watch a preview of this video at http://www.legacyfamilytree.com/videos.asp or purchase at http://legacyfamilytree.com/Redirect/Store-Videos.asp. We've all got a brick wall or two in our genealogy. Mine is John McCALL in Washington County, Tennessee. Fortunately there's lots of good advice to help us. See Michael John Neill's "brick wall alphabet" here.